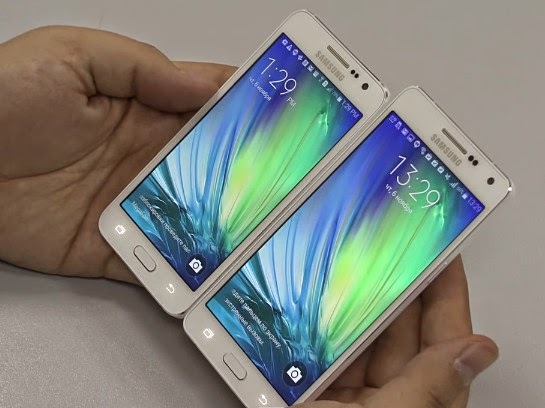 Samsung Galaxy A5 Duos, A5, A3, Official : What's Special About The New A-Series? With 23.7% smartphone market share posted in Q3 2014, Korean Giant - Samsung Mobile - remains to be the biggest handset maker in the world -- a lofty title it has held since Q3 2011. Such feat would have called for a big celebration if it weren't for the fact that, despite being number one, the company also happens to be facing one of the most trying times in its recent history. To quote IDC, "Samsung remained the clear leader in the worldwide smartphone market, but was the only company among the top five (including Apple, Xiaomi, Lenovo, and LG) to post a negative year-over-year change. With continued competitive pressure from nearly every side coupled with cooling demand, the company's volumes have declined from their previous record highs at the start of the year." The recently launched Samsung Galaxy A5, A5 Duos, and Samsung Galaxy A3, which come with a refined, trendy design and supposedly 'the most advanced functions to support social networking', represent the Korean Giant's refreshed strategy to maintain its number one position in the handset game all while increasing its total market share in the near future. "The Samsung Galaxy A5 [, its dual SIM variant: Samsung Galaxy A5 Duos,] and A3 offer a beautifully crafted full metal unibody, slim design, superior hardware and the best possible social media experience," shared JK Shin, CEO and Head of IT and Mobile Communication at Samsung Electronics. "These devices make our advanced Galaxy experience even more accessible to young and trend conscious consumers." The mid-level Samsung Galaxy A Series indeed comes with a number of features never before seen from the company in this price echelon and I bet fans of the brand are hoping that these changes would be enough to ward off the competition in this category in the coming months. And speaking about the competition; They are quite a bunch. New handset makers, mostly from mainland China like Meizu and Xiaomi, are taking chunks away from Samsung's entry-level and midrange smartphone market share in an unprecedented scale. In the Philippines, local players Cherry Mobile, MyPhone, and Starmobile along with foreign ones like O+, Sony, LG, Lenovo, Gionee, Huawei, Asus, and Oppo are very aggressively challenging Samsung's dominance from all directions with varying marketing techniques. TP Friends, given all the leaked information about some upcoming handsets from the above-mentioned competing brands, do you think these enhancements on the A Series could help Samsung's cause in 2015? Compared to earlier midrange releases by Samsung that lack a real metal side frame and are often thicker than 9 millimeters, the Galaxy A5 and A3 are Samsung’s slimmest smartphones to date, featuring refined full aluminum unibody designs that are 6.7 mm and 6.9 mm thin, respectively. Both devices will come in a variety of colors, including Pearl White, Midnight Black, Platinum Silver and Champagne Gold, to accommodate the personal style and preference of diverse users. According to Samsung, the Galaxy A5 and A3 offer a superior mobile and social experience to young consumers who want to express their unique style while constantly staying connected. Sporting an advanced 5 MegaPixel front-facing camera, taking vivid selfies is now easier than ever before. (In contrast, apart from the recently releases Grand Prime, previous mid-level Galaxy phones only had a maximum of 2 MegaPixel front shooters.) Innovative photo-taking features, such as Wide Selfie, Palm Selfie, Animated GIF, Beauty Face Features, and Rear-cam Selfie, let users capture attractive selfies in high resolution by automatically detecting and focusing on a person’s face. Users can also quickly and easily share photos or videos on Facebook, Twitter, or Instagram as the devices support ultra-fast LTE Category 4 network speed standard. Apart from mini versions of flagship releases as well as the Galaxy Core Max, Galaxy M, and a couple of other devices, earlier midrange smartphones from Samsung never came with the company's brilliant SuperAMOLED display. 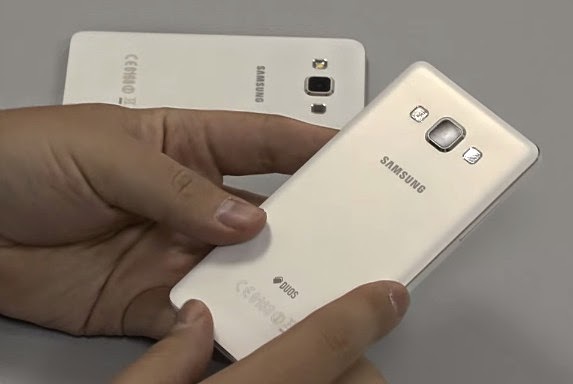 With the Galaxy A5, A5 Duos and A3, Samsung is officially bringing the extraordinary SuperAMOLED display and Adaptive Display technology to the mid-level echelon to deliver clearer images with deep contrast and better viewing angles for more vivid, colorful content in virtually any environment, even under bright sunlight. On top of that, Samsung Galaxy A5 and A3 are also equipped with a Quad Core 1.2 GHz ARM Cortex A53 and Adreno 306 GPU based Qualcomm MSM8916 Snapdragon 410 processor for smooth touch response, sleek screen transitions and faster browsing experience. Additionally, the Galaxy A5 and A3 include handy and popular features exclusive to Galaxy devices, such as Ultra-Power Saving Mode, Private Mode and Multiscreen, as well as adjustable audio that intelligently adapts and enhances sound output based on the ambient sound. Samsung Galaxy A5, A5 Duos and A3 will be available in select markets including China starting in December 2014 and will be out in other territories - hopefully, including the Philippines - within Q1 2015. The official SRP of Galaxy A5 Duos in China is 2,599 CNY or roughly Php 18,690 with current conversion. Once they hit store shelves, Galaxy A3 and Single SIM A5 are expected to don a price tag in the area of $350 and $450, respectively. TP Thoughts: To tell you frankly, in spite of its many cool features, I'm not so sure if the metal-clad Galaxy A Series will be the line to protect or save Samsung from the continuous and reckless onslaught of affordable yet amazing handsets from China (like the very affordable Meizu M1 Note, Lenovo Music Lemon, and even the follow-up to the wildly successful Xiaomi Redmi 1S. And we're not yet talking about the barrage of 2015 flagship releases from these companies that should cost far less than Galaxy A5 Duos with its mid-level specs.) Why? Well, considering what other brands are offering for a whole lot less, I think a lot of consumers would find this line a tad too expensive. That said, if Samsung will stick to this strategy, it's not hard to imagine that the next year will definitely be a challenging one for them. Now, as a tech blogger who's aware that there are many Filipinos who rely on Samsung for their monthly income, I'm sincerely wishing the Korean Giant all the best.